I wanted to start this discussion in hopes of getting feedback, theories, foreseeable pitfalls, (dis)advantages, etc. 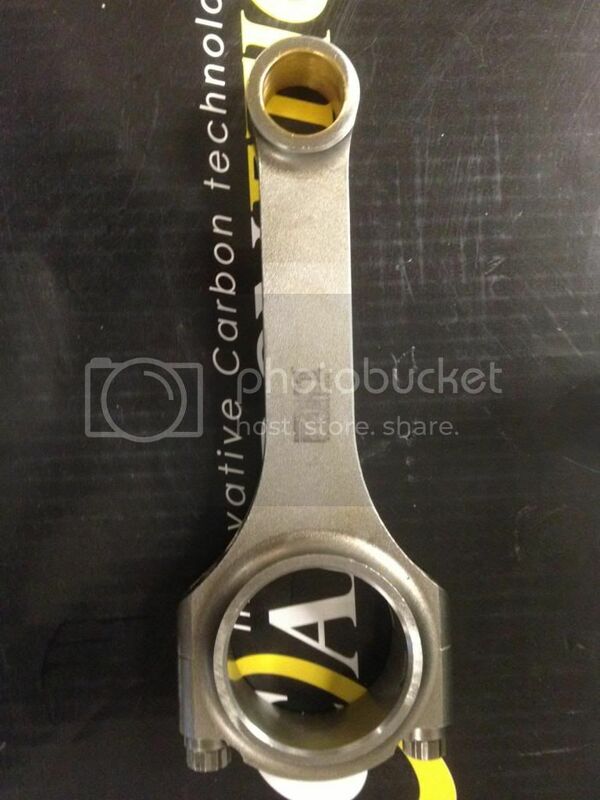 concerning possibly using forged aftermarket connecting rods designated for motors other than the S54. A little background surrounding my initiative to find a lower cost option for a built S54 sorta stems from my previous SC400 project, which is indefinitely delayed due to the purchase of my ///M. I was looking to build a nice high-revving, moderate HP NA motor using the capable 1UZ-FE platform which Toyota based on CART/IRL design. No doubt the engine was up to the task but the aftermarket parts, particularly the rods, were very few and far between and the cost of eight was astronomical. After searching and finally having discussions with a fella in Australia who was a resident 1UZ DIY expert, in stepped a proven alternative. Using his set-up and recommendations as a base I quickly picked-up a set of Lentz forged Winston Cup rods complete with 3/8" Carr bolts, EDM holes for wrist pin lubrication, passed NDI, and had been used for one race (682 miles total). The rods were estimated to be around $2,300 and I purchased them for roughly $350 for the set. Anyway, enough of the non-essential info. I guess the best way to approach this, is to post what I have found for the S54 so far and what may constitute as an alternative forged rod to use. Head Gasket Thickness = .762mm/.03"
Main Journal dia. = 60mm/2.36"
Rod Journal dia. = 49mm/1.93"
K20 crank rod journal dia. = 48mm/1.89"
Another perk is that you just can't be underwhelmed by the aftermarket support for Honda motors, so finding the right sized bearings is not a problem. Heck there are so many choices out there, that it may negate the need to remove as much rod journal material as originally proposed. I'm just beginning to delve into part/size availability, however Honda's yellow bearings look like they maintain .0015" clearance on a 48mm rod journal dia. So what I'm looking at are the K1 lightweight rods which are going for about $410 (x2 req'd) a set on ebay. They are roughly 460g, compared to OEM 632g, and when coupled with a lighter piston, say JE's 308g, I'd have a pretty nice lightweight rotating assembly. In fact I'd be looking at shaving almost 2kg total weight from the rotating assembly. There's also the option of running SPS-Carr bolts for extreme RPM. Well, I'll end it here and hopefully you guys can toss this around and leave some feedback. I'd want to know the exact material spec and strength of both. The S54 travel distance/sec at 8000 RPM exceeds most street engines. The angles and forces applied by the S54 piston diameter and stroke are possibly close per cylinder on a Honda engine, but I don't know them much at all. I'd be concerned w/o knowing these things that the rods may not handle the forces. Why do you not want to use the stock rods, do you have an engine with one failed? So what I'm looking at are the K1 lightweight rods which are going for about $410 (x2 req'd) a set on ebay. They are roughly 460g, compared to OEM 632g, and when coupled with a lighter piston, say JE's 308g, I'd have a pretty nice lightweight rotating assembly. In fact I'd be looking at shaving almost 2kg total weight from the rotating assembly. Shaving 4-5 lbs off the rotating assembly would be pretty sweet. Does the K1 weight of 460g include the bolts? Hey Red, have a look at this article, particularly to the piston motion and rod comparison sections. Some pretty interesting stuff. I know the thresholds and conditions are a lot higher than the S54 but I think it can relate, one way or another, to both the high revving K20 (8600 redline) and S54. Both motors have pretty different approaches to rod:stroke ratios, with the K20 being 1.61:1 and our motors at 1.53:1. Don't quote me hal, but I think that may be with the ARP2000 bolts. AND, I failed to include the addition of piston rings. Do most manufactures quote piston weights with or w/out the pins? Add that in if they don't. Just a FYI the K1 rods are a China made rod. I actually have one right next to me right now for a motor for someone. Fit and finish are like any other cheap Chinese rod. The beam of the rod looks a little small compared to the competition. The crank end usually needs some machine work. I would rather have a stock rod over the K1. Keep your cheap Chinese rods. I'll stick with the factory cracked and forged rods. The greater point is still to pull from other fitments that might be more cost effective....but you go boy. I'd have a hard time justifying the savings (~$800 not including time and labor to machine/modify?) over something like a Carrillo that is made for this application. I also see little point in touching the rods unless going stroker. By the time your done buying the K1 rods and doing the machine work on them its not even really worth it. Carrillo and Pauter both make a off the shelf set of rods. All times are GMT. The time now is 10:01:50 PM.